Commercial Stair Systems that are Pre-made and Ready to Install. ErectaStep Commercial Series pre-made staircases are the top quality in the commercial stair industry as they are precision engineered, and prefabricated. 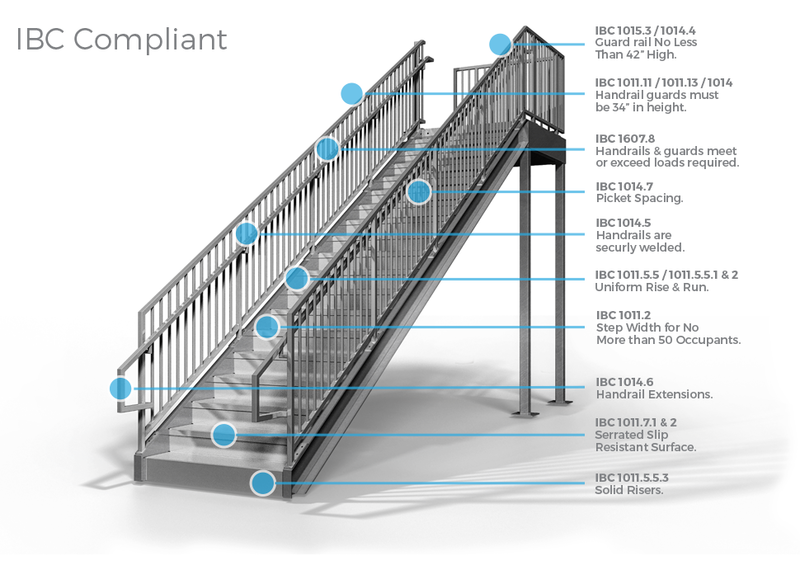 ErectaStep is perfect for all applications; residential, commercial and industrial and our commercial stair systems are fully compliant, designed to meet or exceed all International Building Codes (IBC) related to metal staircase construction. Commercial Premade Staircases provide an efficient, complete solution for a wide variety of applications, from office buildings to storage mezzanines to residential. Stairways have to be at least 44″ if occupant load is over 50 and 36″ width if under 50 occupants you can go to. Stairs must have at least 80″ of head height measured off the tread nosings and it needs to be maintained for one additional riser depth at the bottom of the stairs. The riser height must be between 4″ and 7″ and the treads must be at least 11″ deep. Stairs with winders need to be at least 11″ deep and when 12″ in from the narrow edge and the minimum depth must be 10″. ErectaStep commercial stairs with winders will be custom orders. Stair landings a required for 12′ vertical stairs inclines and must be at least as deep as the stairs are wide (up to 4′-0″). Where a door opens into the landing it can’t project more than 7″ into the required depth of the landing. Handrails in IBC buildings need to return to a wall, a guard or the walking surface or continue to another handrail. The IBC requires that your handrail extend 12″ past the top riser and one tread depth past the bottom riser. It important to note that the ADA will require you to go one tread depth plus 12″ past the bottom riser so it generally overrides the IBC. Stair handrails need to be on both sides of the stair and can’t project more than 4.5″ into the stair width on each side. On a very wide stair you need to space intermediate handrails no more than 60″ apart. They are required to be mounted between 34″ and 38″ above the tread nosings and landings and mounted a minimum of 1.5″ off the wall. 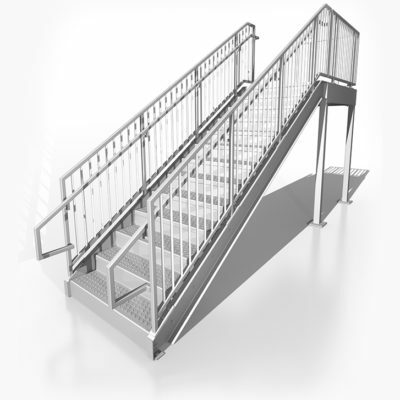 ErectaStep uses Round metal handrails and it’s required they need to 1.25″ to 2″ in diameter. 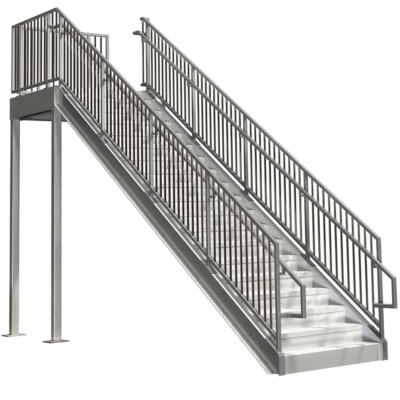 While not applicable to ErectaStep’s commercial handrails, square handrails is required to have a perimeter between 4″ – 6.25″ with a maximum cross section of 2.25″.